We offer fresh Thai basil "horapa" but this is the more spicy "grapao" basil. Also called "hot basil" because of it's peppery, exotic flavor. The product is a fresh arrival and maintains a great deal of flavor. You can mix it with our fresh basil, or use alone to add peppery basil flavor to all kinds of soups, fried rice, or noodle dishes. Try it in our Spicy Thai Chicken, Gai Pad Grapao recipe. Also see our Yellow Pepper Soup recipe. This is a fairly large bag, for generous use. 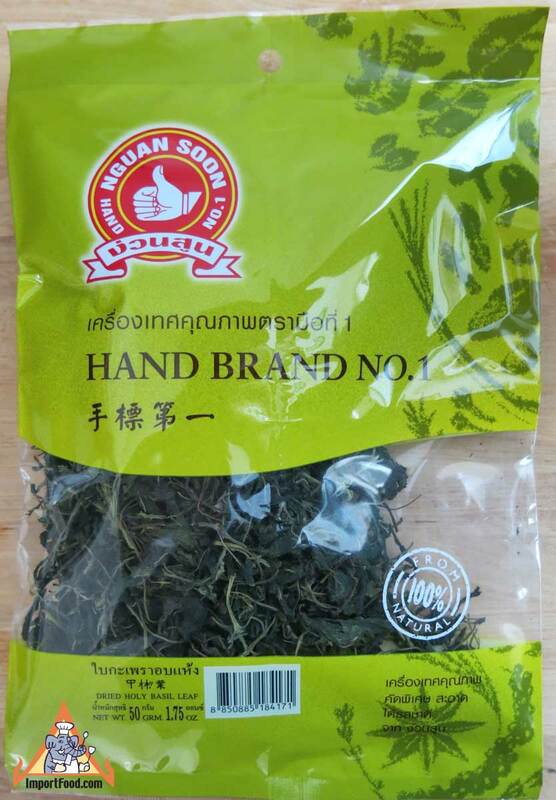 Ingredients: dried holy basil leaf. No preservatives. Product of Thailand. We also offer a coarse-ground holy basil powder. Related Street Vendor Video: "Pad Grapao Talay"